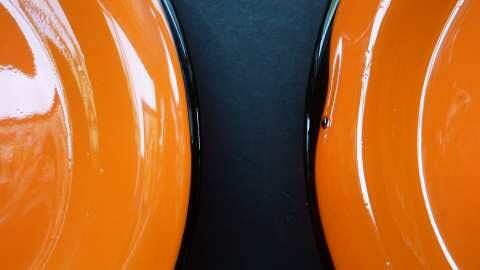 Set of Four Loetz Tango Glass Fruit Plates with black applied glass rim trail. There are tiny flecks or silver inclusions in the glass which you often find in Powolny glassware. 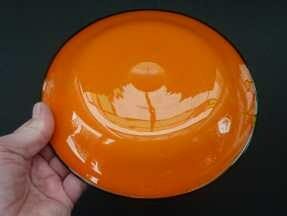 Each plate has been hand blown with polished pontil mark on the base. 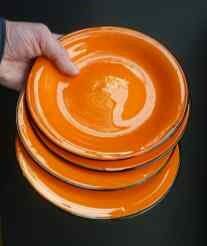 Each plate is 8 inches in diameter and with a height of only 1 inch. 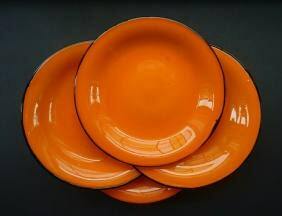 These Art Deco plates or shallow bowls are hard to source and all are in perfect condition with no damages.